Choosing the right pet for you and your family is something we take very seriously. We hope that you research your pet and understand their needs and what to expect from them before making your purchase. It is hard to understand the prickliness of a hedgehog without meeting one in person. We often have requests for people to come and “check-out” our hedgehogs before making a purchase. Treating our customers the way we would want to be treated is very important to us and we want all of our customers to know we care about each new pet placement. So, we welcome pre-purchase visits. In return, we ask that you respect our time, energy, and talents with your visit. When you visit we will treat you just like a purchasing customer and do our best to answer all of your questions, allow you to handle our babies, and share our passion with you. Unfortunately, we have had visitors who took advantage of our time and resources, with no real intension of ever purchasing a pet from us. My time is very valuable to my children and in order to protect my family and my business, I now require a $25 deposit to “visit” the shop. By handling a couple hedgehogs you can make a more educated decision on whether or not they are the perfect pet for you. Should you decide to purchase a hedgehog from us, the $25 will be deducted from the price. Should you decide that one of our pets is NOT right for you, you have simply invested $25 into your potential pet knowledge and hopefully had a great up-close and personal experience with some cool animals. The $25 is good for all immediate family members or a total of four people if you choose to bring friends. We understand that some people will not like this policy and that is o.k. We hope that you can appreciate our family values and the protection of our time for other customers as well. I have read the "Visiting Policy" above. "YES"
Please note that Educational Visits are included as part of your Hedgehog purchase. 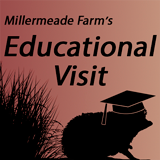 If you have reserved a specific hedgehog, it is not necessary to reserve an Educational Visit.